A member of the Pioneer front ensemble. Pioneer of Milwaukee, Wis., started the evening's proceedings in Bloomington-Normal under semithreatening skies. The corps performed its 2003 program, "Spirit of the Pioneer," as well as a "march-by" performance past the appreciative audience, which consists of a healthy percentage of Bands of America students in Bloomington-Normal for a band camp. 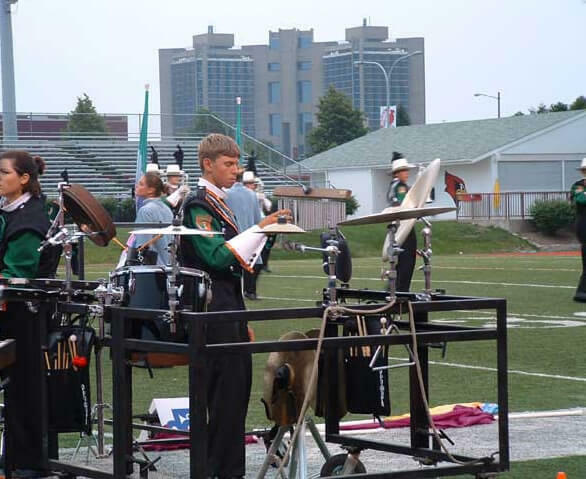 Kyle Gonzalez, a front ensemble player from South Milwaukee, Wis., elaborated on his favorite segment of the Pioneer show. "(My favorite part was) the jam section in the last tune," Gonzalez said. "It really gets the crowd going."